He is the best kitten in the world! We all love him so much. We have named him Smokey. My dog is really good with cats so Smokey is doing good with her. The other cats are still adjusting, but I expected it to take a few weeks. The kids are also good with pets. I just have to watch the 4 year old. I am so glad my path crossed with Smokey. That you for all you do to help homeless cats! Here is a picture of Pepper and Jack. Yes we will probably change his name but we haven’t decided yet. He is a very sweet cat. Left him in the family room by himself when we wernt around till our daughter left for her Europe business school trip. So he took over Pepper’s tree. This didn’t set well at first. They have been working out there differences. It looks like Pepper will be the ruler. They have been playing together yesterday and today and looks like all is working out. They now seem to share the tree. Both cats ignore the dogs and the dogs ignore the cats. Pepper will rub on the dogs at times and has chased them to play. Jack at first but when you got him out of hiding didn’t try to get away. He does’nt seem to hide now so all looks as will work out fine. He is a very good cat. Peppermint Patty is doing great. She has taken over the whole place. She doesn’t have a shy hair on her and she is very affectionate and demanding. She sits in the window to catch the morning sun and has a slew of admirers. She does try to get out the door. I am wondering if she misses you when she gets restless, so I usually just distract her into exercising. She doesn’t much care for dry food, but I only give her a TBS of can food twice a day, and she loves her furball treats which we make a game of. She loves to play and run and climb so she is a fun cat. Some day soon, though, she will have to learn to stay off the table and kitchen counters. She likes being brushed…just loves being held and petted. I mostly let her come to me, which she usually does on a hourly basis. She now likes my electric chair and jumps up and sits in my lap for attention and when I am sleeping or showering, she claims the chair and I have to bodily remove her to get it back. She is so smart. Just a while ago, she came in my comp room and talked to me and took me to the fridge where I keep the can cat food and of course, I had to give her the nightly spoonful. I know I sound like I’m bragging but I am only stating the facts. Peppermint Patty is extremely smart. She knows when it’s time to go to bed and she waits impatiently for me to finish computing, coming to get me until she succeeds and off we go. She starts the night sleeping with me, but because of my arthritis I am a restless sleeper and before morning she goes to sleep in my electric chair which is next to my bed. She wakes me up every morning by purring in my eyes. LOL When I take my afternoon nap, she sleeps with me or on me and under the covers with just her little head uncovered. I could go on and on and on about her, but I am sure you already know all of this about her. My approval for her still hasn’t come through, but the landlord said there shouldn’t be any problem but it more likely is just a matter of time. Okay, little miss Pattykins has been in here to get me to bed twice in the last half hour, so I will just end this now and go read and pet the cat LOL. Just wanted to let you know that Caleb (a.k.a. now “Sammy”) is doing fantastic! He has settled in nicely and has claimed our bed as his bed! He jumps up on our laps all the time and just rubs up against our legs and follows us around the house! I thought I would send you a picture of Bambi/Sophie and let you know how she’s doing. She’s been a great addition to our family. She’s filled out and her fur is beautiful. She’s slowly coming out of her shell and engaging with the other cats, and even playing. 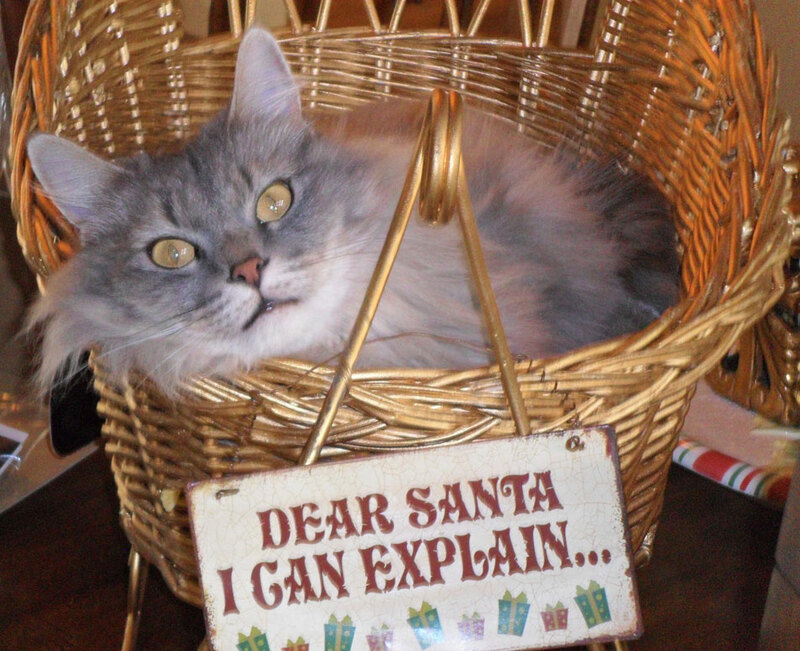 She loves to be wherever I am and can usually be found curled up in a basket. 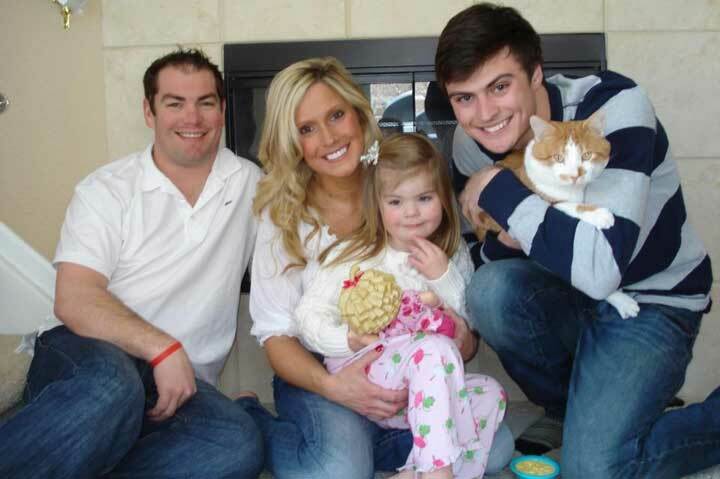 Thank you for rescuing Sophie and working so hard to find homes for kitties like her. We wanted to thank you so much for rescuing and nurturing such a wonderful little guy–he has blossomed and is such a vital member of our “pack”! 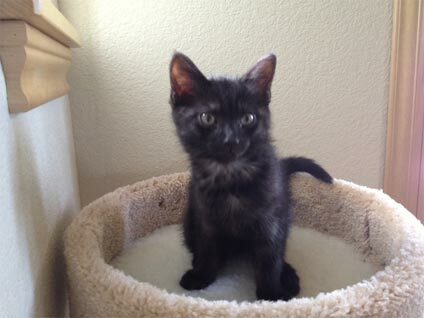 We’ve renamed him Porter: Dark and mellow like our favorite beer, yet mischief occurs when he is around! Remarkably, he seems to be having a “second kittenhood” and wants to play more than anything else, including eating! He is eager to present us with the orange mouse first thing in the morning, and when Kevin comes home for lunch or we get home from work he runs to the front door to greet us and “leads” us to where the mouse is, ready for us to throw it. He stalks it all day as he hides it under furniture, in shoes, and even in the houseplants. Do you know where we can buy them?? I’ve looked everywhere, and it’s getting rather threadbare! I’ve taken needle and thread to it to try to piece it back together. He has dozens of other toys and ignores them all in favor of this one! His latest trick is to play fetch, and bring it back to you! He is very bright and alert, and shows no signs of wanting to get back outside. We’ve built him perches in windows looking out over the back yard, and he carefully monitors the birds and squirrels out there. I think that our favorite time with him is when he snuggles with us in the evening on the sofa. His wonderful throaty purr always makes us laugh as it increases in intensity to the point where there are intermittent squeaks in there. Even funnier is the fact that although he has a little bed to sleep in that is on our bed, he leaves it during the night to creep up towards Kevin, where I often wake up in the middle of the night to see Kevin’s arms around him! It’s been almost a year since Porter came to join us, and he has really enriched our lives! He is becoming quite a snuggler, and I cherish the times when he cuddles in my arms in bed and turns to face me and “hug” me like he and Ginger used to do together! He won’t pose for me right now, as he is currently taking his umpteenth bath this morning, but I’ll pass along a pic of him “watching TV” with Kevin! So glad to be able to donate food, especially in honor of Porter and the way he was one of the first kitties to appear for food when you fed his colony. A small kitten braved the cold with a snowy storm on its way. Too sick to eat, it wasn’t interested in the traps set by a Forgotten Felines volunteer with tuna in order to rescue it. Then, luckily its mom showed up, was hungry and interested in the tuna, and went into the trap. The volunteer, seizing the moment, decided to use the mom as “bait” and set up a trap directly next to the trapped adult. The kitten went in the trap to get to its mom, and in doing so made its first big step to a better life. Teebow was happy to be rescued and just purred and purred. After being force-fed baby food for a day, he then started eating on his own. A week later he had a cute round belly and doing what a kitten does best – playing. Teebow was one of the lucky ones, saved from a life on the streets and in a loving home. 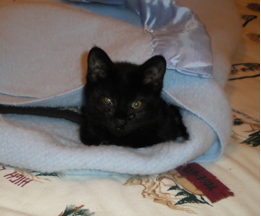 A Forgotten Felines volunteer received a call last winter about an injured kitten that had been spotted. In talking with neighbors the volunteer learned that the kitten had gotten its leg caught in a chain link fence as she was scaling it, and her leg was severely broken. Observers remembered her cry of pain when it happened. After many, many attempts to trap her, she was finally rescued. Her broken and infected leg was removed, and she recuperated in a foster home. Then Benni, as she was named, began making the transition from a frightened young cat into one that purred when picked up. She learned to navigate around quite well on her remaining 3 legs, and didn’t hesitate when jumping up on her elevated cat condo/ scratching post. Then the quest began for a special human to adopt a special cat, and that someone was luckily found. 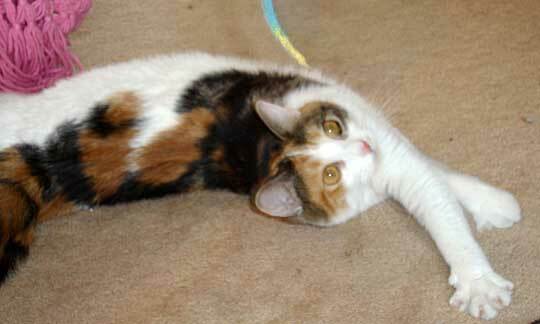 Benni now is in a wonderful home and loves her new human friends. A new feral colony began with a call from a friend one Sunday late November. She had spied a kitten that morning in an industrial area in north Denver. Returning in the afternoon she found the kitten alone in a deserted fenced lot and called me. We were able to trap the kitten and also discovered that the junkyard next door was her home along with other kittens and feral adults. Within several days, 3 female adults were trapped, spayed and returned to their home where they are being fed regularly. 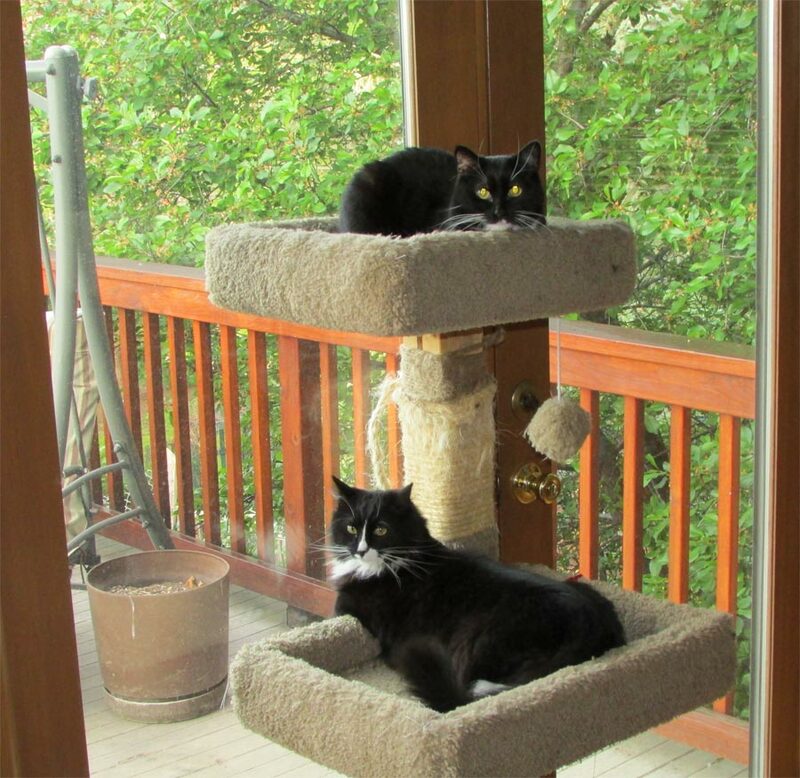 3 kittens including Pumpkin & Tuddles were socialized and the quest for a loving home began. Several other cats living in the junkyard were also trapped and neutered/spayed. 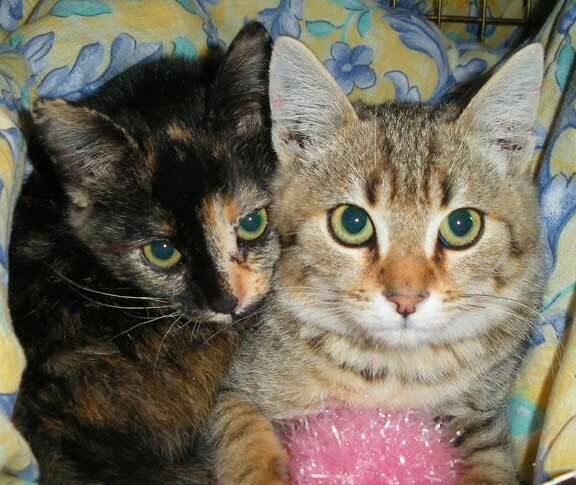 Pumpkin and her friend Tuddles were adopted together to a loving home. In the process of trapping the feral cats, an adult male was also trapped, a dirty orange and white boy we named Dennis who turned out to be a very sweet 2-year old.